I love giving gifts. I will look for any excuse to make a gift, make a card, scrapbook pictures as a gift, bake, or write a thank you card. I love giving gifts, making gifts, and making lists. So today I made a list of ten gifts I thought would make awesome gifts for Easter! Celebrating the resurrection of our savior Jesus is just as important in my home as celebrating his birth and I love doing something special in celebration. Here are 10 Easter gifts that I absolutely love. I found this wall art on Zulily (which is one of my favorite online stores). It has a nice looking rustic frame. Rustic seems to be the ‘in’ thing now, but I live in Maine so that is kind of irrelevant. It says “I am a Child of God” which is the perfect reminder that we all need that should be hanging in our home. From Zulily again. This is an adorable flower pot that would make a wonderful gift, especially if you have the time to plant a Lily or Tulip in it. I’d like to give this to everyone I know. The pot says “May God Fill your heart With Gladness to Cheer You”. This pot would be wonderful for anyone in your life and yourself. Remember, no matter how bad your day, week, or month is going (or even your year!) God is with you and loves all His children. From Wayfair, my other favorite online store. This wall art is so pretty and has such humor! You need to have a sense of humor as an adult and especially as a parent! This wall art says “Dear God, so far today I have done alright. I haven’t gossiped or lost my temper. I haven’t been grumpy, nasty, or selfish and I’m really glad about that. But in a few minutes God, I’m going to get out of bed, from then on, I’m probably going to need a lot of help. Thank you and amen.” Haven’t we all had a least one morning in our lives (or just this week) like that? I need humor and laughter in my home and this is just the spirit! This picture is framed and on canvas, so it will look nice in any home. I love this travel mug! From Bed, Bath, and Beyond, this travel mug an awesome way to travel with your love of God. If you are going to be running around with coffee you might as well do it with a mug that says “God Is My Rock” because he sure is my rock and I hope he is yours too (or will be someday)! I know this would make a great gift for my husband who works in rain, snow, and shine and loves coffee. Always a reminder and something he will use daily. This canvas is from Kohls. It reads Matthew 19:26 “With God All Things Are Possible” and that couldn’t be truer! 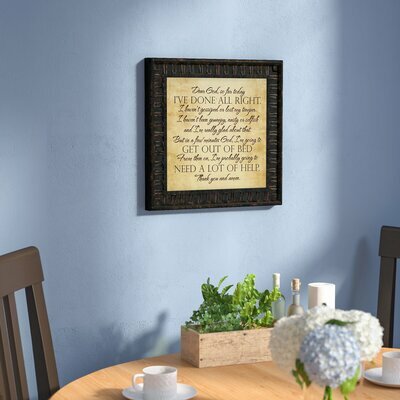 With the size only being 16″X20″ it will fit well anywhere in your home and is a wonderful reminder. I’d like to put this in my office where I pray the most (and pay bills). This gift will be going to a good friend who could use the reminder when things get tough. I know this may be closer to a Christmas gift, but I think it is such a beautiful piece. This sculpture is handmade and painted by hand and has such elegance. 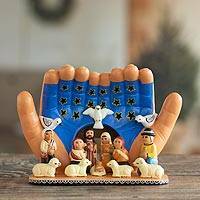 I like having the nativity up year round in my home but have struggled to find the perfect year-round piece. Crafted in Peru and from the Novica store associated with National Geographic, this is the perfect year-round piece that is a double gift. Novica is a fair trade online store that supports local artists from all over the world and gives artists a free and fair way to display and sell their work. This not only makes a wonderful gift but buying this piece is also a gift to the artist who created it, the profile you can view on Novica. Zulily does it again for me. This pretty Angel just yells ‘perfect gift giving’ gift. I just love the bright colors and the message. The Angel reads “May God Fill Your Heart With Gladness To Cheer You” which is such a beautiful message to pass on to a good friend or family member. 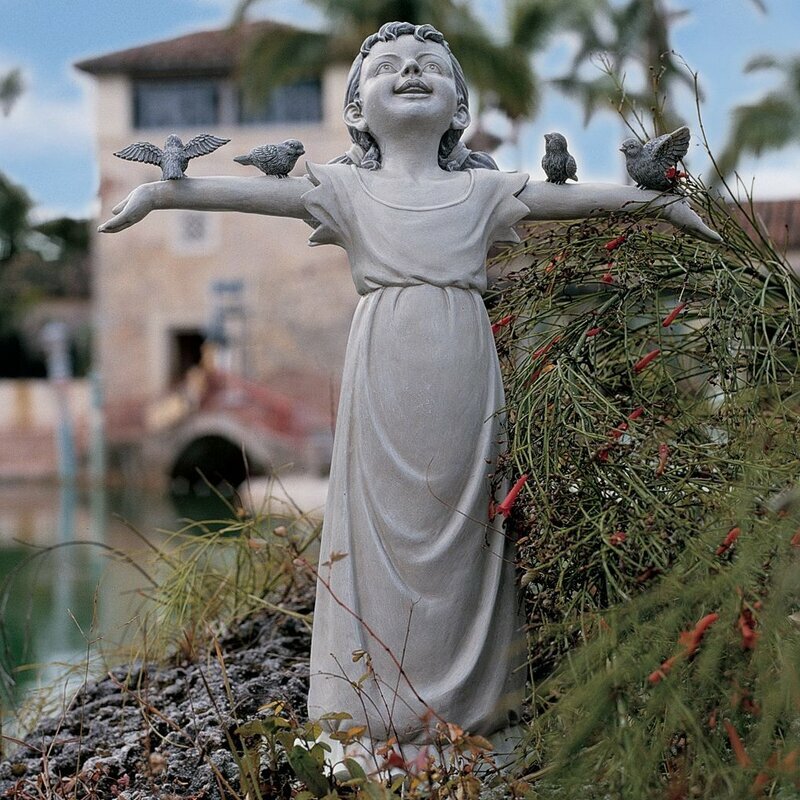 Back to shopping at Wayfair, this statue just warms my heart. The statue is hand painted and only weighs 4 lb. It is only 18” H x 14.5” W x 6” D and would look nice inside or in a flower garden. This is a great gift for the flower gardener in your life and brings such joy. There is nothing like the joy of a child in love with Jesus! Take a trip to New York without leaving your couch and changing out of your PJs, my favorite kind of traveling! From Saks Fifth Avenue this dessert plate is 9″, porcelain, and dishwasher safe (even better). By the looks of the website, the dish is not part of a set but it sure is a pretty piece and a wonderful gift. This is beauty beyond words. Another piece from the amazing Novica store, everything about this piece was handmade and hand painted. Look at the detail! Made by one of the most passionate ceramic artists I have read about, Alberto Aparicio Canchari. 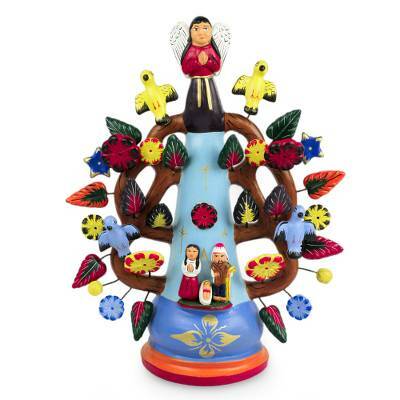 I love how Mary, baby Jesus, and Joseph are the beginning of the Tree of Life on this piece. Another double gift (Novica supports local artists), this piece has detail and care anyone can appreciate. I hope you enjoyed my list of Easter gifts for Christian adults. I know it isn’t the perfect list and maybe such personal Easter gifts (and Easter gifts in general) are a little unconventional but I had such fun making this list and shopping for those I love most in celebration of Jesus. If you have other gift ideas please feel free to comment them. Thank you for looking over the list and I hope it gave you inspiration and ideas. Happy Easter! and I hope you are having a successful and inspirational Lent season.